The University Archives owns a copy of “The Congress;” a PBS/Ken Burns documentary on the history and function of the United States Congress. Researchers can come in and view this DVD to learn more about the Legislative branch of our government. This entry was posted in Research Resource on November 5, 2008 by Moakley Archive. At the Archives our collections have many strengths. One of these strengths is the coverage of El Salvador and its civil war during the 1980s and 1990s. You might be surprised that you can find archival information about a small Central American country here at the Archives but Congressman Joe Moakley, who worked closely with Salvadorans and Salvadoran refugees during the 1980s and 1990s, donated his personal papers to the Archives in 2001. Since a substantial portion of his papers deal with his work in, with and for El Salvador, we have created a research guide to help you navigate directly to the primary and secondary resources we have or have identified in other places. This entry was posted in El Salvador, Research Resource on October 8, 2008 by Moakley Archive. Suffolk students are lucky! They attend a university in a city where there are amazing resources for all types of research. On campus, Suffolk students may utilize the University Archives, the Sawyer or Moakley libraries, but if they need more sources to draw from Boston has many repositories to assist research. Need help on finding additional resources? The University Archives has A Researcher’s Guide to Boston by Ann S. Lainhart. This book lists repositories in Boston where they can find materials on, among other things; vital, church, cemetery, military and seman’s records. Stop by the Archives to see this resource. This entry was posted in Research Resource and tagged Archives, Moakley Library, Sawyer Library on July 11, 2008 by Moakley Archive. Suffolk students have the opportunity to carry out Joe Moakley’s mission to the people of El Salvador through a partnership between the Moakley Archive and Institute and the SOULS office. Students spend 7-14 days on Alternative Spring or Winter breaks helping Salvadoran communities Moakley worked closely with. 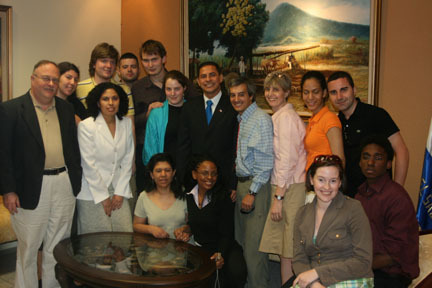 Students typically do construction, listen and learn from Salvadoran officials and locals- experiences during their Civil War and foster relationships. If you are interested in the 2009 trip contact the Moakley Institute at 617-305-6295 or the SOULS office at 617-305-6306. This entry was posted in El Salvador, Moakley Institute, SOULS Office and tagged El Salvador, Moakley, SOULS Office on July 2, 2008 by Moakley Archive. Audio and video of oral history interviews available online! The Archives has made audio and video available for four of its oral history interviews. Interviews from the Moakley Oral History Project include video of Congressman Joe Moakley and Congressman James McGovern and audio of Law School Alumna and Moakley classmate Jeanne Hession. As part of the Suffolk University Oral History Project audio from History Professor John Cavanagh’s interview is now available. This entry was posted in Uncategorized on May 30, 2008 by Moakley Archive. Are you a faculty member who could benefit from incorporating archival documents into your teaching regimen? Or maybe you know a faculty member? You don’t have to teach history, government or political science to take advantage of our collections. Our materials cover a wide array of topics. Take a look at our research topics and see if you can utilize the archival resources right here on campus. We also offer classes on teaching archival/primary source research methods. This entry was posted in Uncategorized and tagged archival, faculty, government, history, political science, research methods on May 15, 2008 by Moakley Archive. The Moakley Archive and Institute is co-sponsoring a one-day conference on the Subprime Lending Crisis. This conference features U.S. Representative Barney Frank, he currently serves as the Chairman of the Committee on Financial Services. Students are encouraged to go and it is free to attend but you must register! Two copies of the book are on reserve at the Moakley Law Library. This entry was posted in Uncategorized on May 12, 2008 by Moakley Archive. He was born in 1880. He was a Mayflower descendant. He worked in a lumber camp before he went to high school. He had his way paid through college and law school. He opened “Archer’s Evening Law School” in 1906. He wrote law textbooks. 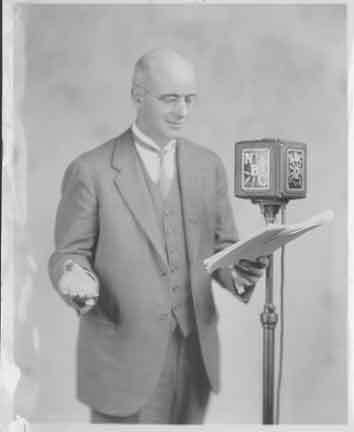 He was an NBC radio broadcaster during the 1920s and 1930s. He was a critic of Franklin Delano Roosevelt. He established a successful blueberry farm. He had three children. He died of cancer in 1966. Want to find out more about Suffolk’s founder? His personal papers are open for research. You can contact the Archives for more information or look at the MS108 finding Aid. This entry was posted in Uncategorized on April 23, 2008 by Moakley Archive. C. Walsh Theatre was once a movie theatre. In the 1920s Gleason Archer opened a movie theatre to generate revenue for the Law School. 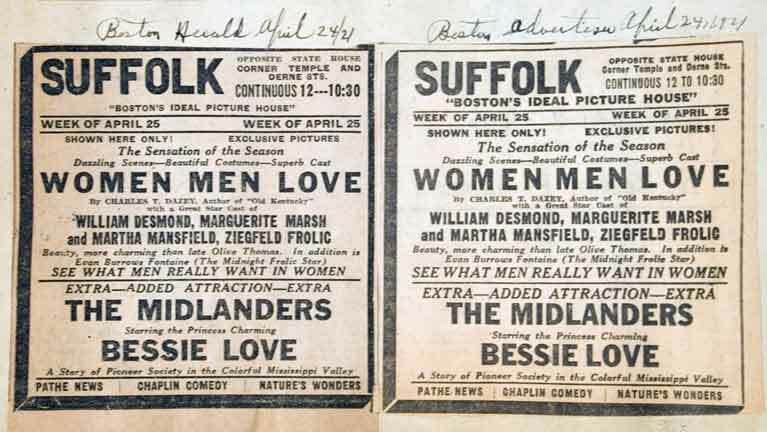 This entry was posted in Suffolk Snippet and tagged C. Walsh Theatre on April 17, 2008 by Moakley Archive. In observance of Patriot’s Day the Archives will be closed on Monday April 21. This entry was posted in Uncategorized on April 16, 2008 by Moakley Archive.